Anthony Lamacchia Broker & Angela Harkins Broker Associate. Waltham, Mass. 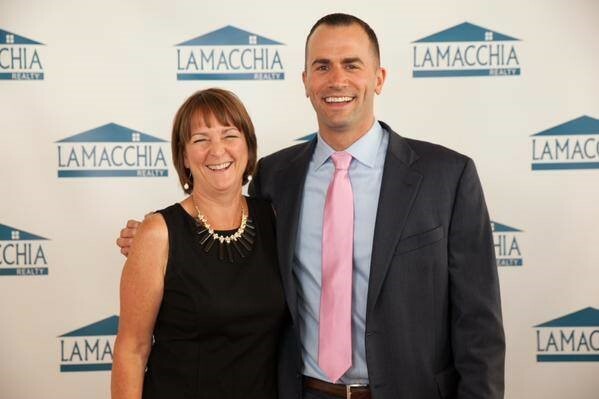 (August 3, 2015) – Lamacchia Realty announced today that the Westford, Mass. real estate firm Angela Harkins and Associates has joined Lamacchia Realty. The firm is led by well-respected real estate industry veteran Angela Harkins who has been a top producing realtor in the Westford and Southern New Hampshire markets for many years. The addition of the Angela Harkins and Associates is the first expansion of Lamacchia Realty (formerly known as McGeough Lamacchia Realty) since launching the new brand on July 23, 2015. Lamacchia Realty has been doing business in Westford and surrounding towns and Southern New Hampshire for many years and will increase its market share in the area by adding the talents of Angela Harkins and Associates. In addition to being a top producing agent, Angela is also a leader among Realtors with her work in the Northeast Association of Realtors, where she was a past president, and the Massachusetts Association of Realtors, where she currently serves on the Board of Directors and on the Executive Committee. Other agents at Angela Harkins and Associations who will join Lamacchia Realty include Winnifred Chicoine, Kathrynn Kazanjian. and Angela Harkins and these agents will continue to work independently on their own businesses under Lamacchia Realty. “In addition to superb real estate training for Realtors, Anthony’s innovative marketing has allowed his company to thrive in any market condition and I wanted my agents and me to have the opportunity to be a part of that growth and energy,” said Harkins. Harkins aims to substantially increase her business and build her own team at Lamacchia Realty which will be known as the Angela Harkins Team. Anthony will be supporting her in that effort. He has been leading the Lamacchia Team, the largest and most successful team in Massachusetts every year since 2010. “I am very excited to provide Angela and the agents in her firm with our training and coaching. My number one priority will be to assist them in growing their businesses and to help them service their clients. I am confident that their businesses will dramatically grow,” said Anthony Lamacchia. The company is opening a new chapter of recruiting top producing agents and acquiring other locations that are already successful Real Estate offices. The plan is to have offices in North, South and West of Waltham within a few years.